I was working on purse orders today and decided to take pictures as I went along and attempt to post a tutorial. I don't know who may see this and if it will help any one but I am constantly searching the internet for tips and suggestions and there aren't a lot out there. craftster has lots of great purse tutorials but I don't think I have seen one there just like this. Here is a picture of the purse I made. You can make changes to this basic concept and make lots of different styles. I use this basic pattern for all my purses. 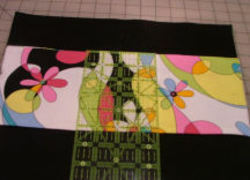 You will need about 1/2 yard of each fabric for outer bag and lining and about 1 yard of stiff fusible interfacing. I use pellon craft fuse. For this bag I made cloth handles attaching them with 4 1" d rings. You can use purchased handles if you want instead. To begin cut 2 of your outer bag fabric and 2 lining fabric and 4 interfacing in a 13" x 12" rectangle that is slightly wider at top than the bottom. Sew across this 4 inch line on both sides. This will form the bottom gusset of bag. I forgot to mention the pocket. Cut a piece of fabric 12 inches by about 13 inches cut interfacing 6 inches by 13 inches. Fold the 12 inches in half and fuse the interfacing to the wrong side. Sew down the long side leaving the ends open. Turn to right side and iron. This will be the pocket. Fold the lining pieces in half to find the center point for marking for your magnetic clasp. I measure 1 1/2 inch from top for placement of my clasp. Make a mark on each lining piece. Now place pocket on one side of lining 3 inches from top edge and pin in place. Mark for pocket divisions. I use a 4" ruler and place it on center and mark both sides. Sew pocket in place on lining piece by sewing across bottom edge of pocket and down the division lines. Now sew lining pieces together down sides and across bottom just like you did the outer bag. 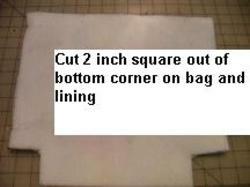 Also sew the corners as you did for the outer bag. 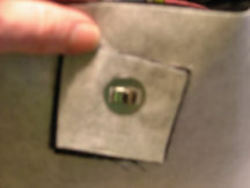 Now place the magnetic clasp in the lining. I reinforce it by using the square piece I cut from the lining corner. 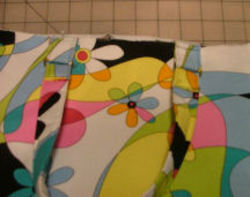 To make the handles cut 2 pieces of fabric 20 inches long by 4 inches wide and 2 piece 10 inches long by 4 inches wide. Cut 2 interfacing 19 inches long and one 10 inches long. Fuse interfacing to fabric. For the 20 inch long pieces fold and iron in half the long way, open the fold and fold short ends in 1/2 inch, fold each side of the long sides into the center fold and then fold in half. Stitch close to the edge on both sides. Do the same with the 10 inch pieces except for folding in the short sides. Cut the 10 inch piece into 4 pieces 2 1/2 inches each. These will be the tabs that attach the strap to the bag. Using a 1 inch d ring sew each tab piece to the flat side of the d ring then attach the strap folding down about 1"
Repeat for both straps. Pin straps to top of outer bag 3" in from outer edge. Zig-Zag across top of bag going over straps several times to be sure they are secure. Now insert bag right side out into lining with right sides touching matching side seams and pin into place. Sew around top leaving a section for turning. Section needs to be about 5-6 inches so that a 4 inch piece of card board can be inserted. I use a fabric glue stick and apply glue to both sides of a piece of cardboard cut the size of the bottom of the bag- this one is 4 inches by 8 inches after turning bag insert the cardboard in between the bag and lining. Now turn down the edges of the opening and pin closed. Top stitch around the top of bag and you are done. I hope this will be helpful and not too confusing. I have never written a tutorial. 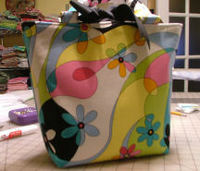 *For this bag in addition to the pellon craft fuse I used a layer of fusible fleece to make the bag a little thicker. It is not necessary and I don't always do this. I just fused the fleece to the outer bag after the craft fuse. 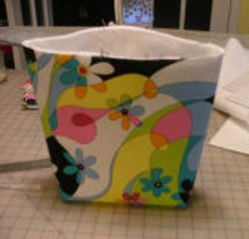 I make a book bag or diaper bag using this same pattern just increase the dimensions and make the handles longer. You can also add ribbon to the outer bag or monogram. 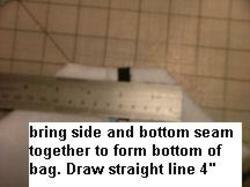 You should do this before sewing the bag sections together.